Why? Segmentation helps you reach out to your diverse customer base on a more individual level. Chances are good that within your list, you have multiple buyer personas. And even within these personas, individual buyers are at various points in the sales cycle at any given time. Blasting the same message to all these buyers is a little like asking them all to wear the same size shirt. The message (and the shirt) just won’t fit. The truth is customers won’t engage with a message that doesn’t speak to them. They want relevance. Seriously. In a HubSpot survey, more than one-third of respondents specifically referenced the word “relevance” when asked why they chose to subscribe to emails from some companies. So how can you deliver this relevance? It’s time to segment your list and send messages that speak to each individual buyer. When you do, you won’t just be pleasing your customers; you’ll be boosting your business. With segmentation, better customer engagement means better conversion rates. 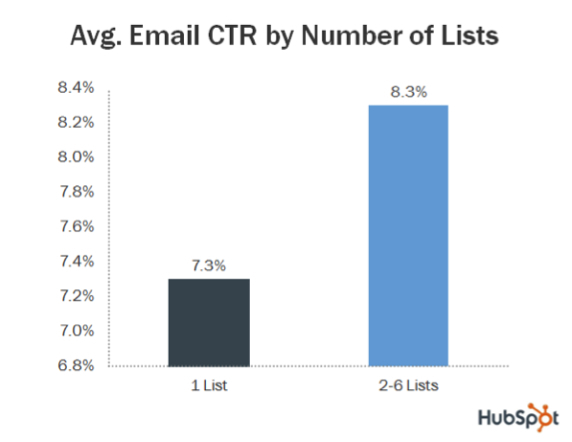 Jupiter Research has found relevant emails drive 18 times more revenue than broadcast emails. But that’s not to say personalization is always easy. The simplicity of batch-and-blast email campaigns can be deceptively attractive. Gourmet flavored syrup brand Monin needed to speak to two different audiences — B2B buyers who were well aware of its product, and consumers who weren't as aware of the brand. To accomplish this, Monin had to create two distinct email campaigns. "Our email campaigns have to find a way to relate to each type of person along each point in the journey," Stasha Johnston, Monin's digital marketing director said. "Any way you look at marketing, from email to website to social, you have to change the way you think about advertising and talking with your consumer, how you build your list, how you keep your list clean and when and how you talk to these customers"
For the campaigns, the Monin team gathered information on the two customer segments by asking them for a variety of information — whether they are a business, whether they subscribe or want to subscribe to Monin's newsletter, if they're interested in cocktails or coffee etc. Then, the company was able to use the data it collected to segment emails to its B2B restaurant owners and the B2C group. "We can be more nimble with our emailing when we have a constant finger on the pulse of what our customers are doing with our emails,” she said. “[Data] gives you a lot of information so that you can build an arsenal to … build these emails that are going to be most compelling to your audience,” said Johnston. The benefits don’t stop with short-term revenue. Segmentation can also drive an important, long-term asset: sender reputation. Subscriber complaint rates are a major factor in your reputation. As we explained in this blog post, one of the best ways to reduce your complaint rate is to ensure everyone on your list wants to receive your emails. Marketers who segment their email lists experience lower unsubscribe rates, better deliverability and fewer spam complaints, which all lead to better sender reputation. Ultimately, data combined with segmentation lets email marketers send customers truly relevant messages—and that means better results for everyone involved. Worried you don’t have enough customer data to properly segment your email list? Get a free trial of TowerData’s Email Intelligence service to see all the subscriber data you’re missing.